The governorships of conservative Scott Walker (R-Wis.) and progressive Mark Dayton (D-Minn.) have yielded dramatically different results. Democrats must tell a better story about what’s possible, and what has worked—in both the progressive Minnesota of today and the progressive Wisconsin of the past. The comparison between Wisconsin and Minnesota was apt: The population, history and landscape of the neighboring states have made them something like twins. Both were settled in large part by Northern Europeans. Both depend heavily on water resources—by some counts, Wisconsin has more lakes than Minnesota, “the land of 10,000 lakes.” And both have strong progressive traditions of investment in the public good, particularly their schools and natural resources. For six years, Walker has bullishly delivered on his promise to make Wisconsin into a paragon of low taxes and few regulations. His and the GOP legislature’s union-busting efforts have seen the state’s unionized workforce decline from 14 percent in 2010 to 8 percent in 2016. And he has greased the skids for corporate exploitation of natural resources. One example among many: Mining company Gogebic Taconite wanted to build a massive iron ore mine in northern Wisconsin but chafed at complying with the state’s environmental protections. In 2013, in collaboration with the company, Walker successfully pushed for legislation to ease restrictions on wetland destruction. As it turned out, Gogebic Taconite had contributed $700,000 to the Wisconsin Club for Growth, a “pro-growth” advocacy group that has supported Walker’s gubernatorial bids—and for which Walker has been a key fundraiser. The company eventually canceled its plans in 2015, in part because it feared conflict with the EPA over wetlands. But the legislation that Walker pushed through paved the way for swift permitting of the mine and the destruction of “irreplaceable lakes, rivers, streams, wetlands and wildlife habitat,” as the Sierra Club’s Wisconsin chapter noted. The relaxed protections remain in place for new proposals. Yet the results of Walker’s “open for business” agenda haven’t been as promised; “job creators” have been derelict in their duty. Last year, the number of jobs in the state increased by about 17,000, bringing the total jobs created under Walker to roughly 185,000—some 65,000 short of what he’d promised to accomplish by January 2015. During Walker’s tenure, Wisconsin has consistently trailed most other states in job growth. Minnesota, meanwhile, tacked the other way and raised taxes on the rich in order to invest in schools. The 2013 budget levied a two percent tax increase on couples who make more than $250,000 per year. The hike generated $1.1 billion over two years, about half of which was earmarked to cover the state’s budget deficit. Much of the rest went to education: $234 million in general funding for public schools, $134 million to expand all-day kindergarten statewide, and another $80 million to invest in early childhood education and special education. Right-wing skeptics warned that higher taxes would send the wealthy fleeing to low-tax states like Wisconsin. Instead, the number of filers in the top tax bracket increased by six percent. And the economy has prospered. Overall, Minnesota ranked 21st in private-sector job growth between 2011 and 2016, versus 34th for Wisconsin. In its 2017 ranking of the top 10 states, U.S. News & World Report rated Minnesota the eighth-best state to find a job, based on its unemployment rate of 3.8 percent and a labor-force participation rate of nearly 70 percent, among the highest in the nation. U.S. News also ranked Minnesota the third-best state overall, based on its strong economy, excellent schools, low cost of living and high median income. Wisconsin didn’t make either list. But by focusing on short-term measures of economic performance, accounts of the growing divide between Wisconsin and Minnesota often miss or bury a key piece of the story. 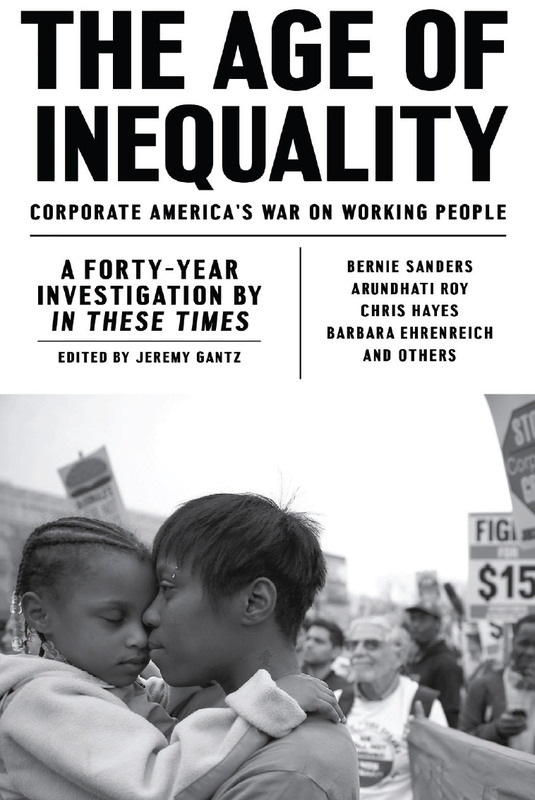 A social-democratic program entails investment in all aspects of the public good, and treats them as inseparable: A healthy and flourishing economy begins with a healthy and flourishing society. The two states’ environmental approaches illustrate the point. Wisconsin has opted for eco-austerity, embracing the conservative dogma that environmental protections are the great enemy of economic vitality. Minnesota has gone the opposite route. The result? While Wisconsin has sacrifced its environment for a neoliberal agenda that fails to deliver, Minnesota has invested in its environment and seen economic growth. Last year, Wisconsin’s Legislative Audit Bureau published a stinging report on the DNR, finding that water quality regulators “failed to follow their own policies on enforcement against polluters more than 94 percent of the time over the last decade,” according to the Wisconsin State Journal. Only 33 of 558 citations that should have been issued were actually written up. The depletion of the DNR is so severe that, last year, the EPA began an investigation into whether the agency is so weakened and ineffective that it should be stripped of its authority. The investigation is unresolved. The ongoing devastation, meanwhile, is quite clear. Lynn and Nancy Utesch spend much of their time documenting the devastation. 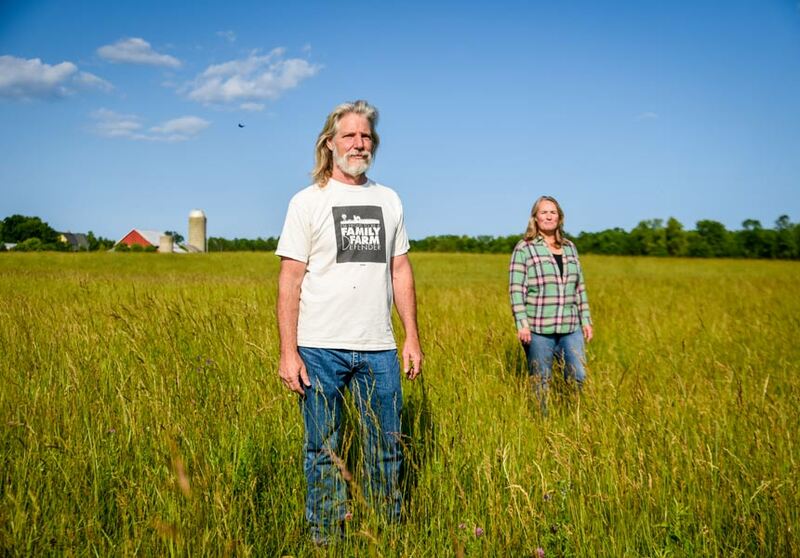 They have a 150-acre farm near Kewaunee, Wis., a town of about 3,000 people nestled along Lake Michigan. Driving along the main street that cuts through the city’s center, you can see whitecaps glinting in the distance. The Utesches have lived in a yellow, post- card-perfect farmhouse since 2004. They raise about 50 cattle and sell the high-end, grass-fed beef directly to their customers. A sign on the edge of Kewaunee welcomes you to “the good life on a great lake.” But under the surface, thousands of tons of manure are sinking into the area’s water supply, making it toxic for many residents, who have been forced to use bottled water. The manure debacle results from the recent, explosive growth of huge factory farms and consolidation within the dairy industry. Since 2010, the number of concentrated animal feeding operations, or CAFOs, has quintupled in Wisconsin. Kewaunee County now has 16. Waste created by the thousands of cows at each CAFO is ultimately spread across farm fields. In theory, there are regulations about the amount of manure that can be spread, but little or no enforcement in practice. And the soil is highly permeable, so the manure seeps into the groundwater. In 2014, a judge blamed “massive regulatory failure” for the contamination of groundwater in Kewaunee County. He noted in the ruling that “numerous witnesses testified credibly and forcefully about the hardship and financial ruin that well water contamination has had on their businesses, homes and daily life.” at ruling is under appeal, and water quality is an ongoing crisis in the county, likely because the DNR lacks both the staff and the will to enforce regulations. More than one-third of tested wells in the county have excessive levels of nitrate, E. coli and other contaminants associated with manure. At a late-June hearing in Lincoln, a town in Kewaunee County, the Utesches and several other locals showed up to protest the proposed expansion of a local CAFO that wants to double its herd size by adding about 3,000 cows. The hearing was part of the DNR’s permit-granting process. 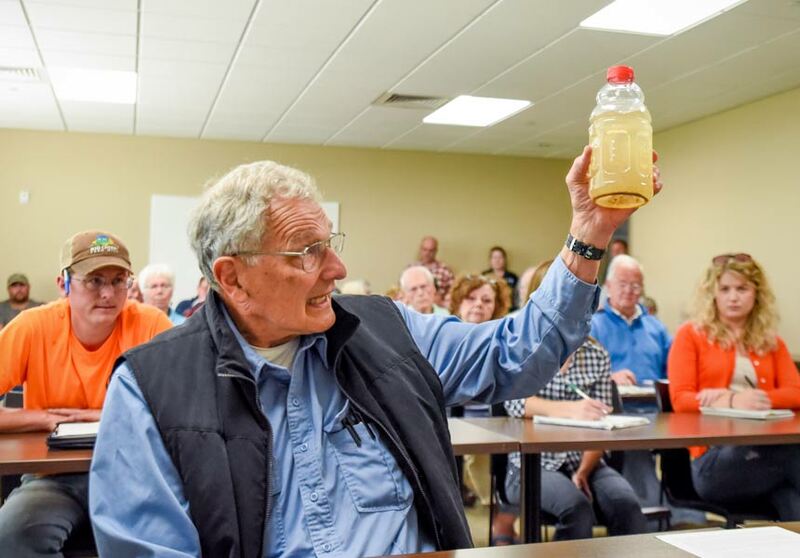 Several witnesses entered evidence of the area’s degraded water quality into the record, and they made their pleas to the DNR to reject the proposal. But Nancy Utesch says it was mostly a matter of bearing witness and creating a paper trail. The dairy industry is a major donor to Scott Walker, and under him, the DNR has been completely neutered. The 3,000 new cows will be added, and the water quality will deteriorate further. Several CAFOs are located near the Utesches’ property, and the couple regularly tests their water. It isn’t contaminated, but with the DNR in the pocket of industry, and with ever-more manure being piled onto the nearby fields, it might only be a matter of time. Minnesotans, meanwhile, opted in 2008 to tax themselves to improve their water quality. Voters approved an amendment to the state’s constitution that raised the sales tax by three-eighths of one cent. The money would go toward a range of environmental, artistic and cultural projects. One-third was earmarked for a clean water fund. That tax increase yields about $100 million annually for efforts to improve the state’s waterways and safeguard its storied lakes. Many are small-scale projects of just a few thousand dollars. One, which will receive $2.5 million from the fund this year, is a statewide initiative to address pollutant runoff. In April 2015, the state’s Pollution Control Agency published a report noting that, in urban areas or areas where land was heavily farmed, half (or fewer) of lakes didn’t meet the “swimmability” standard, due to high levels of pollutants such as nitrate and phosphorous. As in Wisconsin, a major source of contamination is CAFOs. On July 31, Dayton will begin a series of 10 town-hall meetings around the state to gather ideas and build energy for local initiatives. In some areas, the most relevant discussion might be which crops work best to prevent pollution runoff from farming. In other areas, it might be how to improve wastewater treatment. In all cases, it means a willingness to buck corporate grasping at short-term profits in order to protect the long-term health and safety of residents. The momentum for the ongoing water-quality push in Minnesota, Flood says, goes back to getting voter buy-in for water-quality investments back in 2008, when Minnesotans approved the sales tax increase. “Having a constitutionally dedicated fund has been so important in setting the stage,” she says. Minnesota is hardly a perfect torchbearer for social-democratic values. Many progressives were disappointed that Dayton’s buffer program didn’t go far enough. The bill that passed was a scaled-back version of an earlier, more ambitious bill. And since Republicans gained control of the state legislature in 2016, they’ve talked about rolling it back even further. They’ve also passed a $650 million tax cut, provoking an ongoing showdown with Dayton. Even so, six years of a relatively progressive administration in Minnesota, versus a radically right-wing administration in Wisconsin, leaves us with a substantial body of evidence. What’s the takeaway? Minnesota’s tax increases and investment in public goods demonstrate they are compatible with a vibrant economy and support the theory that a healthy economy is inseparable from a healthy public realm. Wisconsin’s tax-cutting and deregulation didn’t deliver the growth Scott Walker promised and are mortgaging the state’s future by degrading its natural resources. It also seems clear that Walker’s assaults on the public sector were as much about enriching corporations and repaying political donors as stimulating the economy. With Trump pushing the same agenda at the federal level, it’s tempting for progressives to focus on preventing the wounds inflicted on Wisconsin from being replicated nationwide. But the Wisconsin-Minnesota case study offers another, equally powerful lesson—one about what works to create shared prosperity. Walker’s flameout in the 2016 presidential race leaves him free to pursue a third gubernatorial term in 2018. Though his poll numbers are in the 40s, he has a formidable war chest from national donors and has defied political gravity more than once. His victories in the recall election of 2011, and again in the regular election of 2014, still sting. 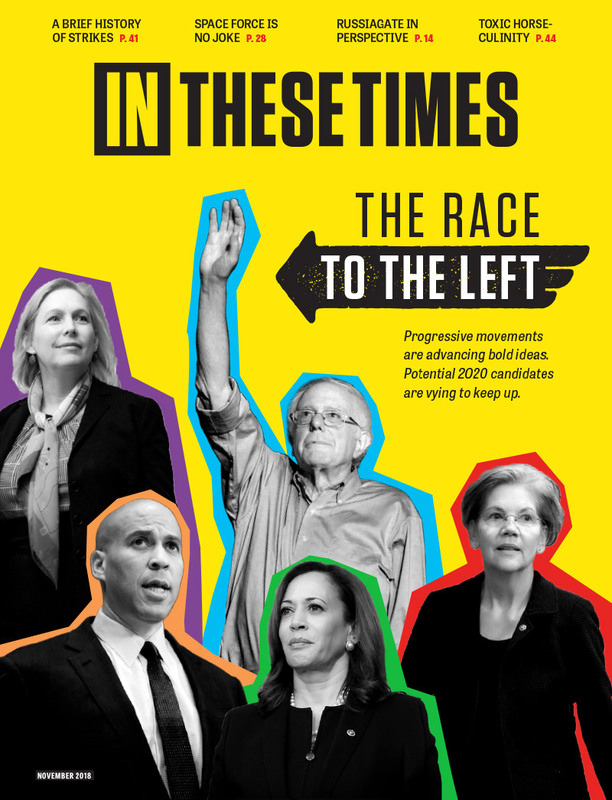 Kraig sees an opportunity for the race to become a testing ground for a different approach to challenging the GOP’s neoliberalism: Tell a better story about what’s possible, and what has worked—in both the progressive Minnesota of today and the progressive Wisconsin of the past. If there is an overarching lesson from this grand experiment, it’s that Democrats have a strong case that public investment delivers shared benefits. Focusing primarily on the negative didn’t work against Trump, and it has never worked against Walker. Unseating him next year—and dethroning the GOP in Congress—will depend on progressives and Democrats finding their voice and articulating a compelling vision. It will mean talking about not only how Wisconsin lost its way, but about how Minnesota took the leftward path to prosperity. I hope rural Wisconsin'ers lead the ouster of that horrendous excuse for a governor in 2018; they've had enough. It has to occur for Wisconsin to begin to restore its land, water, air and society to sanity. Conservatives hate America with an active passion, and always have. Walker is a parasitic infestation as are the current GOP factions in the state senate and assembly. We need to remove most of those parasites from office in 2018 if possible. This means fielding candidates with strong leadership capabilities and an agenda that will move us back on the correct path toward the prosperous state we had before the parasitic Koch machine installed its termites..
On the other hand, how many areas of Wisconsin are known as "Little Mogadishu" and send dozens of former refugees to Syria to fight for ISIS - or, for that matter, to shoot women in their pajamas while they're calmly talking to policemen? I'm hopeful that this story will make it less likely that we'll get a Republican governor in '18. I'm a little worried.